Rosi Mittermaier is most remembered for her exploits in 1976 when she won two gold medals at the Innsbruck games in the slalom and downhill races and silver in the Giant slalom, before capping a superb campaign by winning the overall World Cup title. "Gold-Rosi", as she was known, grew up in the mountain resort of Reit-im-Winkl in what was then West Germany, where her parents ran a hotel and a ski school. Mittermaier joined the West German ski team in the mid-Sixties and won the first of 16 national titles in 1967 in the combined event. A slalom specialist, she qualified for the 1968 Winter Olympics at Grenoble, but disaster struck when she skied off the track and out of the competition. However, the following year she won her first World Cup slalom race and subsequently made a succession of podium appearances during the early 1970's. But her lack of consistency often let her down, keeping her just outside the highly exclusive world elite club. A succession of disappointments was to follow, first at the 1972 Olympics in Sapporo and again at the World championships at Saint-Moritz in 1974. Then, shortly before the 1976 Games at Innsbruck, the great Austrian Annemarie Moser-Proll decided to retire, thereby removing a major obstacle between Mittermaier and Olympic success. Mittermaier arrived at her third Olympics in Austria as one of the strong favourites and she was in no mood to see another great opportunity slip away. The German was victorious in the downhill for the first victory of her career in that discipline, squeezing out local girl Brigitte Totschnig. Next followed her favoured discipline, the slalom, and once again she powered to victory ahead of Italy's Claudia Giordani, winning gold medal number two by just over 3 tenths of a second. A chance at the triple beckoned in the giant slalom but Canada's Kathy Kreiner had other ideas, easing Mittermaier into second place by just 12/100ths of a second. 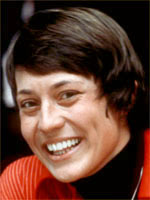 At the end of the 1976 season Mittermaier was at the height of her athletic powers and capped a marvellous season by winning the overall World Cup title. She then announced her retirement at the age of 25 to begin a new chapter of her life in public relations, following her marriage to the skier Christian Neureuther, with whom she has two children, including her son Felix who has become one of Germany's top skiers on the World Cup circuit. She also works with charities including one for organ donors.